This is a follow up to our post last month that listed some of the top tech bloggers according to TechMeme. The goal was to be able to take a look at the individual bloggers who were writing headlines, not just the blogs they wrote for. 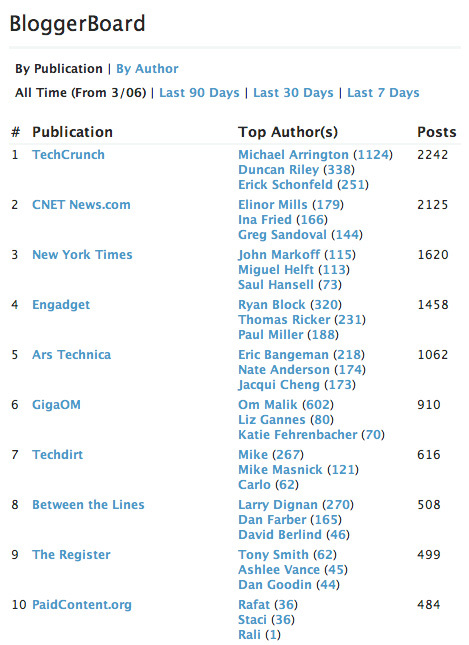 As promised, the team (Mark McGranaghan and Henry Work) has put together much more detailed statistics on the blogs and bloggers that publish tech news headlines and has published it over at CrunchBase. The top 100 blogs are listed here along with the top three authors by publication. The default view is “all time,” which is back to March 2006, but can be toggled to the last 90 days, last month, or last seven days. The image below shows the top ten publications by all time. The data can also be viewed by author here with the same time toggles. Blogs and authors can be clicked on to see links back to TechMeme for each of the headlines. Here’s Erick Schonfeld, for example. This data goes back much further than the TechMeme Leaderboard, and it also calculates things differently. The leaderboard looks at the last 30 days and calculates top sites based on share of headline space, meaning how long a headline stays up affects rankings. Our calculations look only at the raw number of headlines, nothing more. More data is coming soon. And check out StatBot, a new site that is also doing some great work slicing up data from TechMeme and other sites.